Here at Basket, it’s pretty obvious that we love heavy carbs, decadent dairy, and lush sweets. But, we know that the key to a balanced diet (and Shopping List!) is to include delicious fruits and veggies too. So, what better time to honor some of our favorite produce than during National Fresh Fruit and Vegetable Month? That’s right, the entire month of June is dedicated to celebrating fresh fruits and veggies. Not only can they add color and life to a dish, but they also are jam-packed with healthy nutrients that keep our bodies strong! Any time of the year is the right time of the year to incorporate fresh fruit into your meals or as snacks. 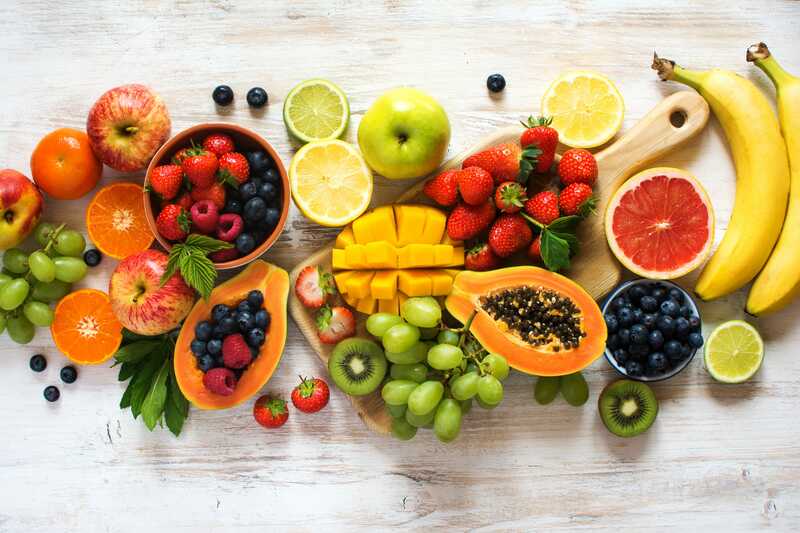 Choose your favorite fruit from the list below to discover what it reveals about your personality! You’re a traditional girl or boy-next-door. Apples are a classic fruit, versatile in flavor and coming in a wide variety. Granny Smith, Fuji, McIntosh – no matter the name, you love ’em. To us, this displays an easy-going personality and a willingness to adapt to your surroundings. Do you go bananas over bananas? You’re a fun loving type of person, who admires the simple things in life. Plus, with all that potassium? You probably have great blood pressure levels. Talk about cool, calm, and collected! If citrus-y oranges have your heart, you most definitely are a vibrant person. You’re always capable of cheering up your friends, and keep the best interests of those you love at heart. Your bright personality lights up a room, and your gracious spirit leaves all those in attendance smiling. Chances are if blueberries are your favorite fruit, nobody’s blue when you’re around. Your humor is one of your strongest traits, and you often leave people gasping for air after you land your punchline. But, don’t rely too much on your great sense of humor – your smarts are great too. Aren’t you just the sweetest? With strawberries as your favorite fresh fruit, we’d guess you have killer manners and are always polite. You never forget your “please and thank you’s” and the idea of you not holding the door for the person behind you gives you severe anxiety. Even if the person behind you is still a bit too far that they have to do that half-walk, half-run to make it. It’s the thought that counts. Go you! Having raspberries as your favorite fruit makes you a bit of a daredevil. You constantly run the risk of not being able to find your favorite flavor sucking candy or ice cream. Plus, with a shorter season than a lot of other fruits, you might struggle to fulfill your craving for your fave fruit. What does this say about you? You’re persistent. You don’t mind going against the grain or walking to the beat of your own drum. Another unique choice! While you might be from New Zealand (cool! ), we know you might also just enjoy the tangy taste of a juicy kiwi. You’re more of the elusive type. You might get an invite to the party, but your friends never know if you’ll actually show. However, when you do show up, you can bet you’re chock-full of interesting stories to tell. Move over, we’ve got a power player in town! Grapefruit fans make power moves. They know what they want, and they go for it. A little tart, a little sweet, but pretty awesome on the inside. You’re an asset to any team you join, but aren’t afraid to take charge when need be. You know the phrase, “Live a little?” If we could guess, we bet you’ve said that to your friends more than a few times. You don’t mind living life on the edge and taking chances. You leap at any opportunity for adventure and your friends know you’re always down to ride, no matter what. That is, if mango is involved. A little sophistication never hurt anybody, and you’re as sophisticated as it gets. You’re classy and charming, with just the right amount of wit. Kind of like the modern-day James Bond, just without all that secret agent stuff. You’re a bit more complex than our other fruit fans. Peach lovers have an ultimate sweet side, but that doesn’t mean they don’t come without their dark side. Similar to how quick a peach can turn, you’re personality is liable to switch any moment. But, we bet that your sweet moments outweigh your more sour times. Can you teach us how to be so chill? If you chose coconut as your favorite fruit, you’re hands down one of the coolest people we know. You go with the flow, and bring easy-going vibes anywhere you travel. Zen might as well be your middle name. You might want to teach peach a few of your ways. The perfect summer treat, your personality is bursting with flavor and always willing to lighten up the party. You know how to expertly juggle work and play, and spend a fair amount of time doing both. You’re known for your time management, but friends love you because you always fit in enough time to hang or grab a drink. Sincere and loyal: That’s how anyone who knows you would describe your character. You have a blossoming imagination and see the world through rose-tinted glasses – or, should we say cherry-tinted? Your creative spirit and faithfulness to those you care about make you a lifelong friend. We get it, tomatoes are technically a fruit. They develop from the fruit of the tomato plant and contain the seeds of the plant. Still, in our eyes, tomatoes are vegetables. If out of every delicious fruit on this list, you chose tomatoes, we would guess you’re the sarcastic friend of your group. Poppable and portable, loving grapes tells us that you are open to change. You don’t like remaining stagnant for too long. Whether it’s your personal life or your work life, if you’re not moving, you’re not winning. Now, be careful grape fans! That can be a good and a bad thing. Remember to live in the moment a bit. Hard on the outside, sweet and full of love on the inside. Much like their favorite fruit, lovers of pineapple might have a bit of an abrasive exterior. However, once they open up to you, they’ll reveal an abundance of positivity, warmth, and fun. They live life by the motto, “Stand tall and wear a crown,” much like the stature of a pineapple. While their regal demeanor might be off-putting at first, it’s their character that counts. If you love melons, chances are you’ve been told several times before that you’re an old soul. More of an introvert, you’d rather stay home with a good book than hit the club. You like your fruit how you like your life, simple and no frills. We can respect that. What does your favorite fruit say about you? Tweet us over at @BasketSavings to let us know! And don’t forget to search for all your favorite fresh fruits on the free Basket app, where we can help you save hundreds each month on your necessities! © Copyright 2019 Basket Savings. All rights reserved.